Ellis Island, located in New York, was the gateway for millions of immigrants to enter the United States from the years 1892 until 1924. April 17th was chosen to celebrate Ellis Island because on this date in 1907, more immigrants were processed through Ellis Island than on any other day in its history – 11,747 people. When is National Ellis Island Family History Day Celebrated? April 17th is the official day of celebration. Official – but not a federal holiday. How is Ellis Island Family History Day celebrated? The Ellis Island Family History Day was celebrated by opening the American Family Immigration History Center at Ellis Island. Ellis Island Family History Day is celebrated by recognizing the achievements and contributions of Ellis Island immigrants and their descendants. For the celebration, the Statue of Liberty-Ellis Island Foundation, Inc offers the Ellis Island Family Heritage Awards to selected immigrants and their descendants for their contribution to the American experience. On this day in 1907, just under 12,000 names were recorded as passing through Ellis Island. During all of 1907, over one million immigrants were processed through Ellis Island. 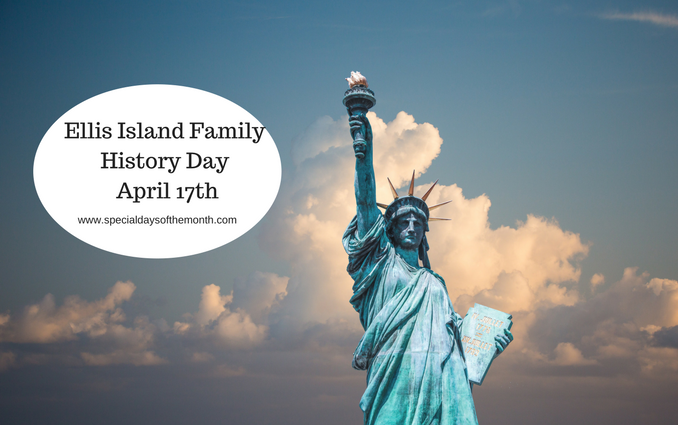 The first National Ellis Island Family History Day was observed on April 17, 2001.